Chief Justice of Pakistan (CJP) Mian Saqib Nisar — apparently in response to ousted prime minister Nawaz Sharif’s recent accusations of judicial complicity in past coups — on Saturday vowed to “protect” democracy while reiterating that the Doctrine of Necessity had been “buried”. “I will not be staying [on this post] if democracy is ever derailed [in the country],” he declared while addressing a meeting of high court and federal judges. “We [the judiciary] are being accused of accepting some cases, of being a part of an anti-democracy campaign, but the judges must not come under any pressure,” he said. “The judiciary is not part of any ‘planning’ and we will not let anyone suffer from injustice,” he added. Conceding that the judiciary had “made some mistakes in the past”, the chief justice said that in order to move forward, the institution will have to hold itself accountable as well. While stressing the importance of dispensing justice that “satisfies the public”. Justice Nisar urged the judges to regard their legal profession with passion instead of considering it a mere job. He added that since the judiciary is an important pillar of the state, judges must ensure that justice is served as quickly as possible. He also insisted that judges must “become a part of the campaign to take the nation forward”. Speaking on the need for judges to be clear-eyed when making decisions, the chief justice once again resorted to Punjabi colloquialisms to explain his viewpoint. Chief justice speaks on the need for clear-eyed decision making. “I was a little surprised, so I asked him: why? He said, ‘Because how can I provide justice if I am not at peace mentally! '” the justice quipped. “So you need to get rid of stress — and that should not be hard as I am sure most of your wives are nice — because under stress, you will not be able to pass good judgements,” he advised. Defending the multiple cases that have been registered in the Supreme Court since he started taking suo motu notices, Justice Nisar said that he had never tried to exceed his authority. The only reason behind taking a suo motu notice of certain issues, he explained, was to ensure that the basic rights of the citizens are protected. He then appealed to the judges to never let any emotion influence their verdicts. 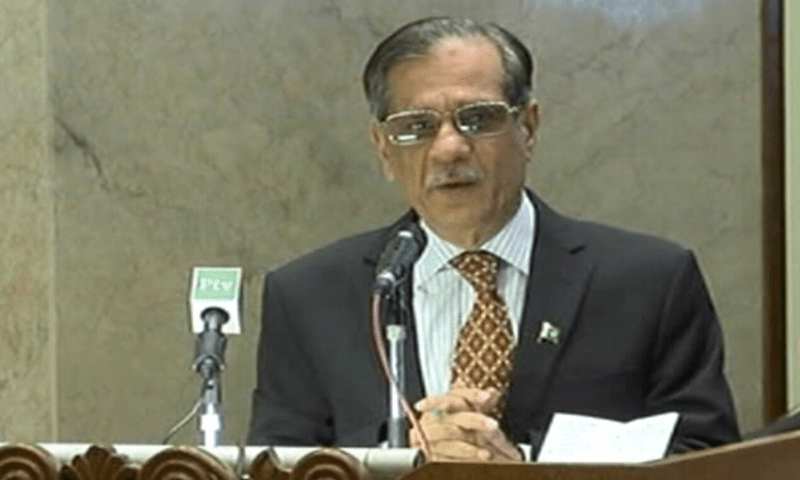 “The judiciary is independent, our verdicts should be independent as well,” Justice Nisar said. There is no difference between a judge of a lower court and the chief justice, he said. Judges can only be distinguished from their peers by the “level of attention” they pay to details of the cases they hear, before passing verdicts, the CJP declared. The CJP admitted that the judiciary was facing numerous challenges but urged everyone in the legal profession to do the best they can in the given circumstances. Referring to a meeting he had with China’s chief justice, Justice Nisar said that the secret behind China’s rapid progress is that the citizens worked for their nation. He encouraged the judges to work towards building a better future for the coming generations. The CJP lauded the tribunal court judges, saying that he values and respects them just as much as those in the “mainstream”. “Tribunal judges should not consider themselves ignored,” he said.